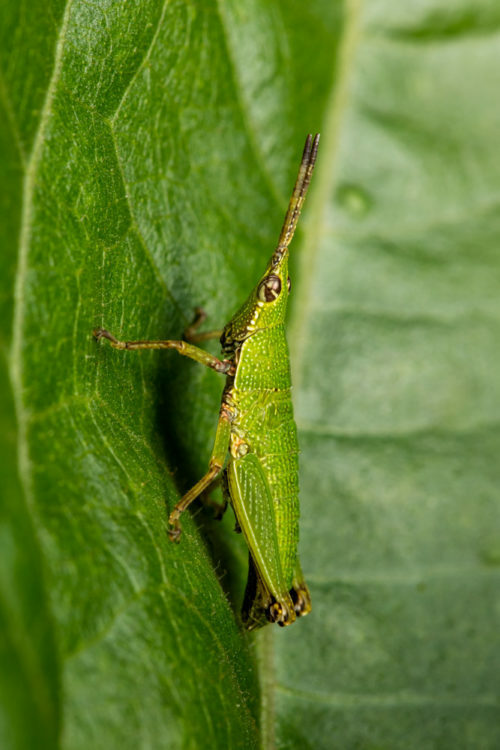 This is a nymph of a variety of short-horned grasshopper (Family Acrididae). 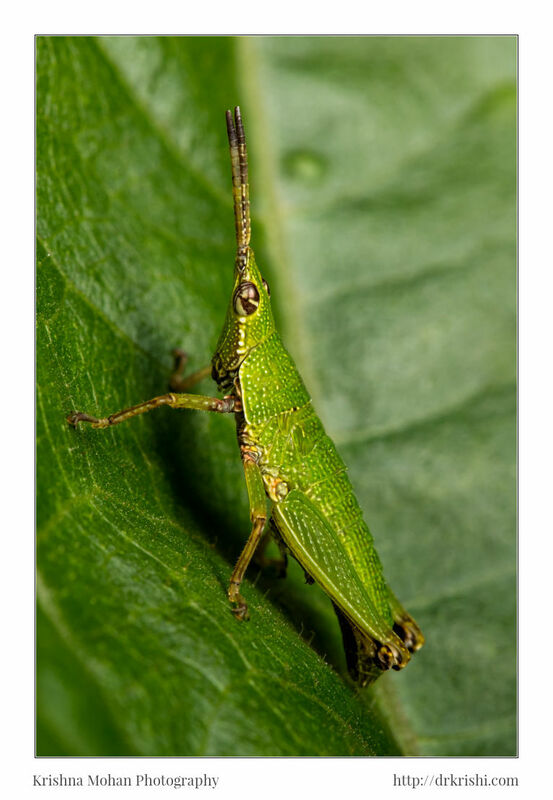 The Acrididae are the predominant family of grasshoppers, comprising some 10,000 of the 11,000 species of the entire suborder Caelifera. 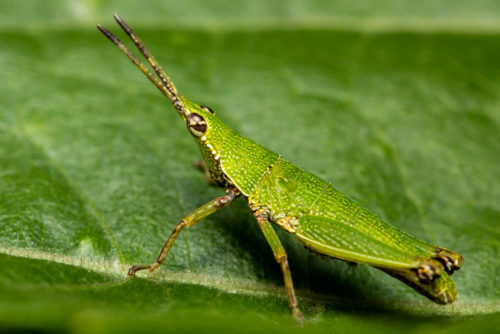 The Acrididae are best known because all locusts (swarming grasshoppers) are of the Acrididae. 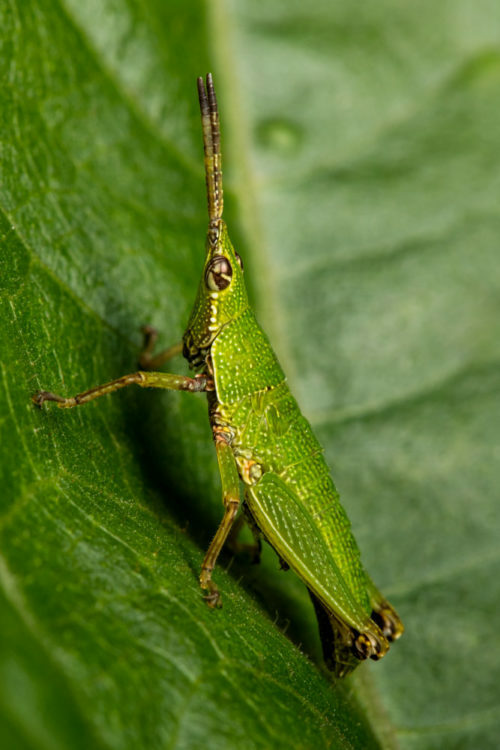 Acrididae grasshoppers are characterised by relatively short and stout antennae and tympana on the side of the first abdominal segment. 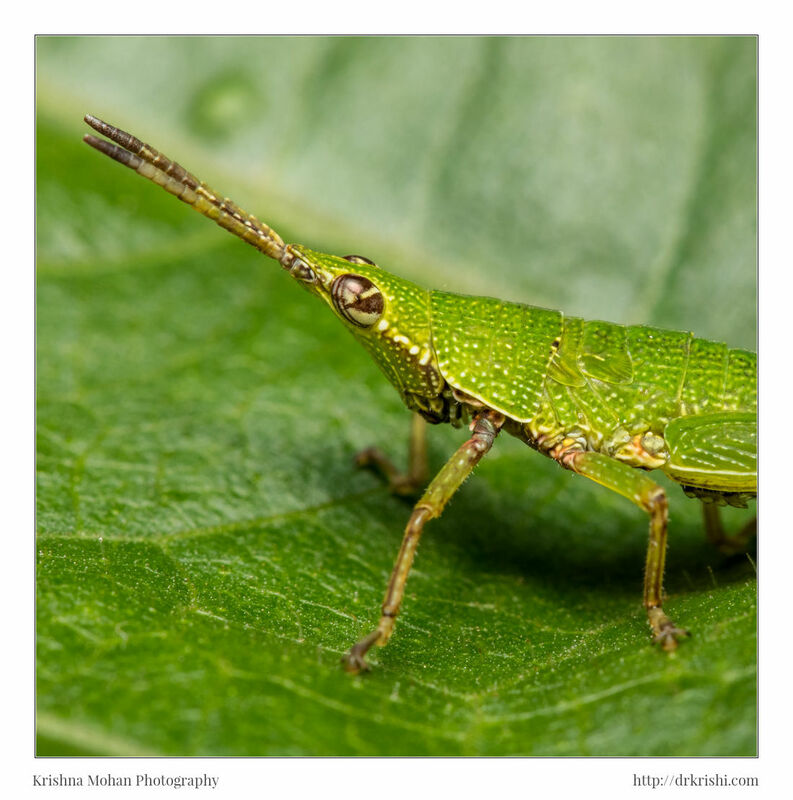 In India, only 1,750 species of orthoptera have been documented out of 20,000 species found in the world. 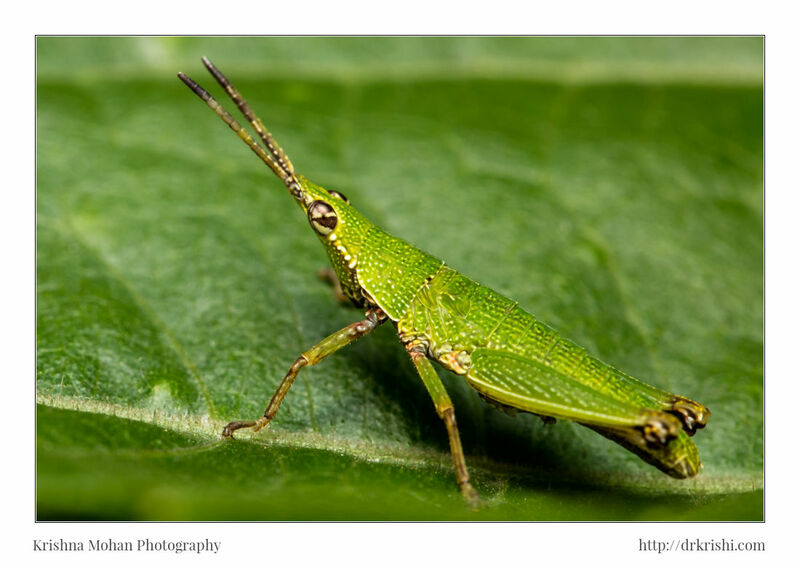 Short-horned grasshoppers range in size from 5 mm to 11 cm (0.2 to 4.3 inches) in length. The shape of the body may be long and slender or short and stout. Many species are green or straw-colored, which helps them blend into their surroundings. The hind legs are adapted for jumping, with greatly enlarged femurs. Some species have wings, whereas others are wingless. 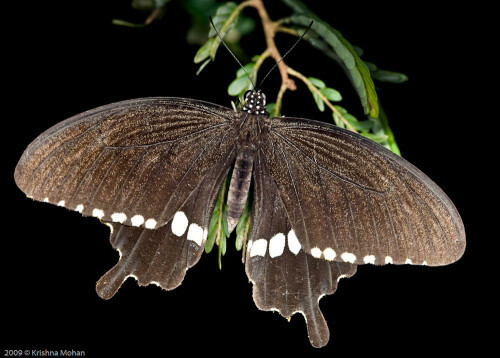 Among the winged species, the males can produce characteristic noises by rubbing the front wings together or by drawing the hind legs across the edge of the wings. Most species have a pair of tympanal (hearing) organs at the base of the abdomen. 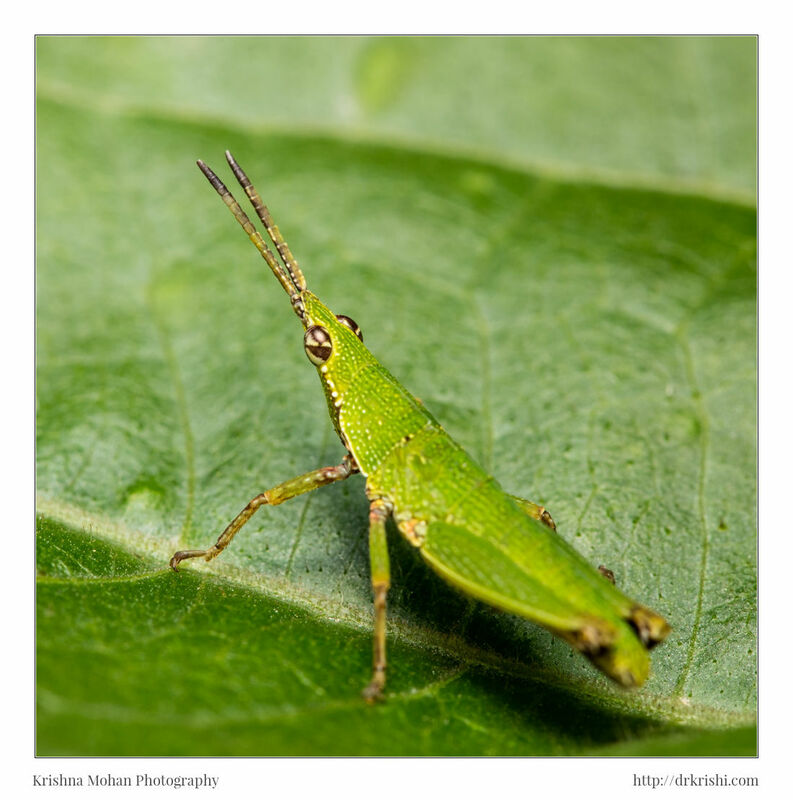 Grasshoppers are of great economic importance because they constitute an important group of pests and pose a constant threat to cereal crops, pulses, vegetables, orchards, and grassland and forest plantations all over the world. 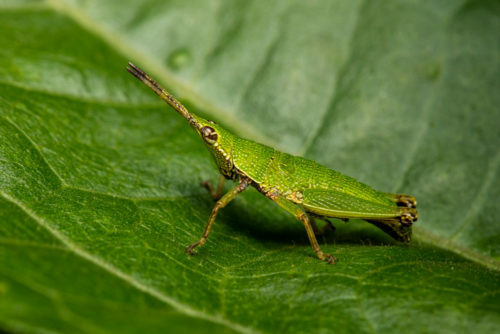 Both nymphs and adults are voracious pests, feeding by biting along the edges of leaves and when found in large numbers causing extensive defoliation, which in turn reduces the photosynthetic capacity of the plant. A female short-horned grasshopper lays about 100 eggs in the soil. The eggs hatch after a rest period, and newly hatched nymphs, miniature replicas of the adults, pass through a series of moults before they become adults. In temperate regions, one to several broods is produced each year. 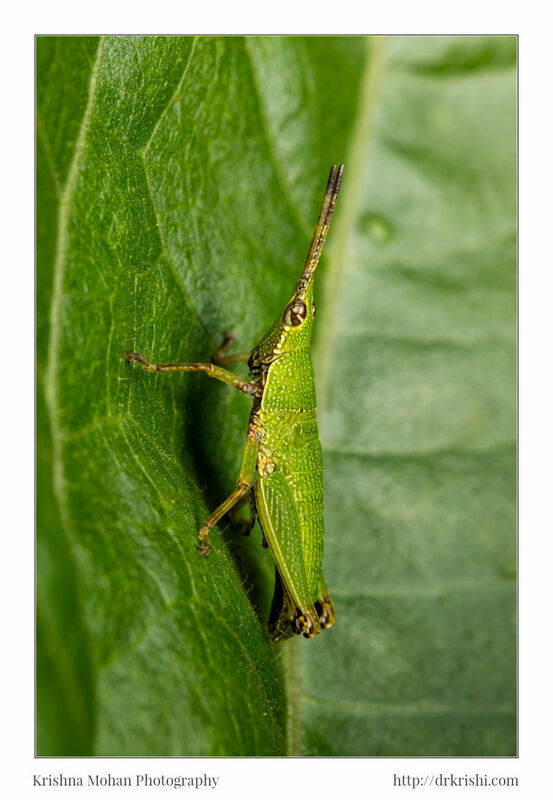 I photographed this grasshopper nymph using a Canon EOS 5DS R with Canon EF 100mm f/2.8L Macro IS USM lens, illuminated by Godox Ving V860c E-TTL Li-ion Camera with LumiQuest SoftBox III. 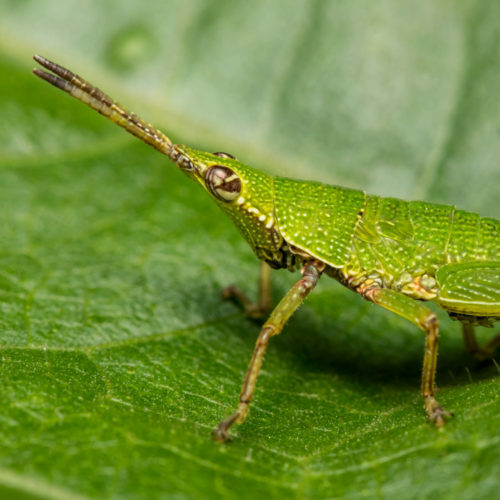 Acridoidea is an important Superfamily of the suborder Caelifera (Short-horned Grasshoppers with three segmented tarsi and a short ovipositor), the others are Tridactyloidea, Tetrigoidea and Eumastacoidea. Tetrigoidea is easily distinguishable from Acridoidea by the elongated pronotum, usually extending beyond the end of the body; by the absence of an arolium between the claws and the two-segmented tarsi of the fore and middle legs. The other superfamilies of Caelifera are easily recognizable at sight and are not frequently encountered. Superfamily Acridoidea has shown the maximum diversity and divided into various families of which the families Acrididae, Catantopidae and Pyrgomorphidae are widely distributed in India. 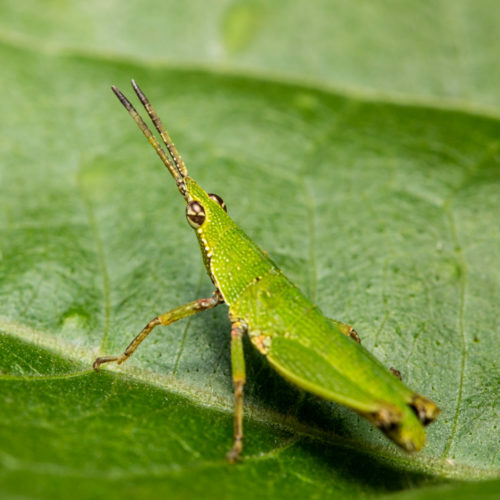 Many insects in this order produce sound (known as stridulation) by rubbing their wings or their legs against each other, the wings or legs contain rows of corrugated bumps. They are also well adapted for the flight since both direct and indirect muscles work together during flight movements thus explaining the reason that these insects can cover long distances during swarming conditions that mainly result from overcrowding and scarcity of food. 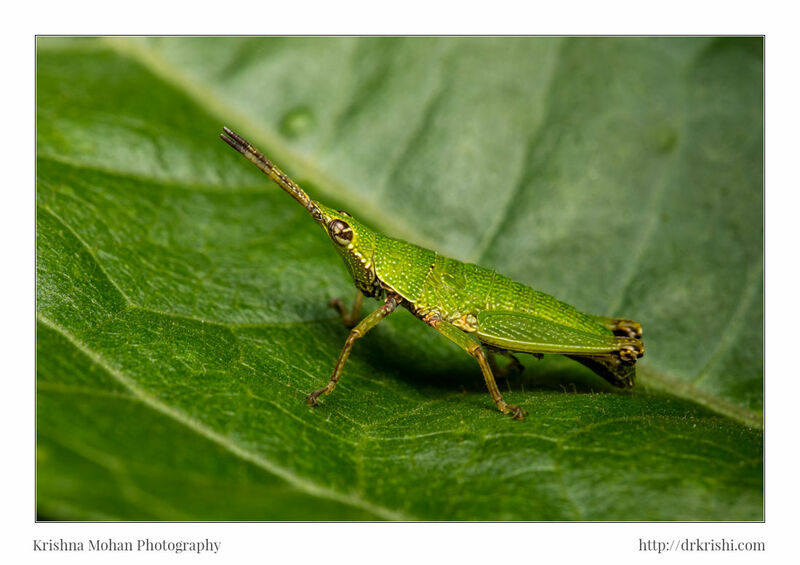 If you want a field guide to check Short-horned Grasshoppers, get this PDF from Zoological Survey of India – Indian Short-horned Grasshopper Pests (Accoridoidea: Orthoptera) Mandal, S. K., Dey, A. and Hazra, A. K.
EXIF info - Aperture : ƒ/11 | Camera : Canon EOS 5DS R | Taken : 28 June, 2015 | Flash fired : yes | Focal length : 100mm | ISO : 400 | Location : 13° 4.0311′ 0″ N 74° 59.7279′ 0″ E | Shutter speed : 1/200s | Images and content Copyright © Krishna Mohan. Please contact me to purchase prints or for image publication license.